This week we are delighted to feature a guest post from internationally acclaimed speaker, author and divorce coach, Christina McGhee. Whether it’s a first heartbreak, a scraped knee or losing a beloved pet, watching your children hurt is undeniably harder than hard. When life presents an unpleasant or painful situation, our instinct tells us we should try to make it better. In that moment, we’ll do just about anything to offset our children’s discomfort, even if it means glossing over the hard parts or presenting a watered down version of the truth. Nothing could be truer when you are facing the task of telling your children that you’re splitting up. In my coaching practice parents often ask me, “How can I keep my children from feeling completely gutted when I tell them we are getting a divorce?” What they really mean to say is, “How can I bypass the hurt or at least make it hurt a little less?” While you may have the best of intentions, side stepping the upset doesn’t really help our children prepare for what lies ahead. Whether approaching a first conversation or subsequent talks with children, here are some key points to keep in mind. Talking about divorce isn’t just hard for kids. It’s also hard for parents. Before initiating a conversation with your children, be sure to sort through your own feelings about how life is changing. Think through what your children will need to hear (i.e. when they will see Mum and Dad, where will they live, what will change about their day-to-day lives etc.) and plan ahead how you will responsibility manage your feelings during the conversation. 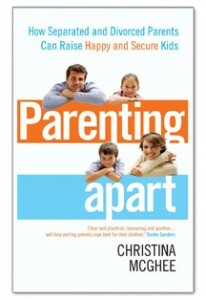 Sometimes parents mistakenly think they can soften the blow for kids by not using the words separation or divorce. Instead they may say something like, “We’ve decided we need a break to think things through.” Other parents try to dodge the bullet by offering an alternate explanation for why things are different, such as, “Mum/Dad has a big project at work and will be moving out for awhile so they can be closer to the office.” When this happens kids are often left hanging in limbo. They may also hold fast to the hope that things will eventually go back to the way they were before. To avoid confusion be sure to talk with your children in a direct way using clear language. Resist the urge to sugarcoat or gloss over. While there can be some advantages to Mum and Dad living apart, avoid exclusively presenting a “divorce with benefits” perspective (i.e. two Christmas celebrations, two birthdays, more presents, things really won’t change that much, we’ll all be much happier etc.) Children need to know that it’s both understandable and normal to feel sad about divorce. – Cause confusion about what’s really happening. – Send a subtle message that it’s not okay to talk about it. Offer a sense of stability. Along with addressing how things will be different, give your children solid ground to stand on by talking about what will stay the same. Also, whenever possible, do your best to minimize the number of changes kids have to deal with in the early stages of your separation or divorce. Keep in mind this does not mean that children should maintain one primary home and only have occasional contact with the other parent. When safety is not an issue, children benefit most when they have consistent and regular contact with both parents. Don’t feel like you have to have all the answers. If a question or issue comes up and you’re not sure what to say, don’t feel pressured to give an answer on the spot. Instead let your children know that you need some to think about the issue or question. It’s also fine to tell them that you don’t know. However, be sure not to leave them hanging. Keep in mind it’s essential to follow up and get back to them with an answer quickly. Additionally, it’s important to understand that no matter how well you explain things or how carefully you word your answer, when it comes to explaining “why” you will probably never be able to completely satisfy your child’s need to know. Above all, resist the temptation to impulsively provide them with more information or too much elaboration on the reasons for the divorce.